CAT Syllabus 2017- कैट पाठ्यक्रम, परीक्षा पैटर्न: Indian Institute of Management (IIM) is going to conduct Common Admission Test (CAT) 2017 in the month of November for offering admissions to the eligible students in administration programs. Therefore the first step for all the candidates who are preparing for CAT is to have precise details of CAT 2017 Syllabus and have an idea of the structure of the exam. The CAT is a multiple choice test and it includes various topics. Therefore aspirants can get here CAT Quant Syllabus 2017 along with the details of other topics. Apart from this candidates can also download here CAT Exam Pattern Pdf and accordingly prepare well for the exam. CAT is conducted every year by the Indian Institutes of Management (IIMs) on the basis of rotation for providing to management programs of IIMs, Indian Institutes of Technology (IITs), National Institutes of Technology (NITs), Faculty of Management Studies (FMS), Indian Institute of Science (IISc) and other institutions. Therefore candidates who are preparing for CAT 2017 can now get here CAT Syllabus 2017, which is designed to assess the prospective admission-seekers’ suitability for MBA education. The preparation of CAT is considered as the most crucial stepping stone for an aspirant seeking admission in IIM and thus distinct preparation and planning is required. 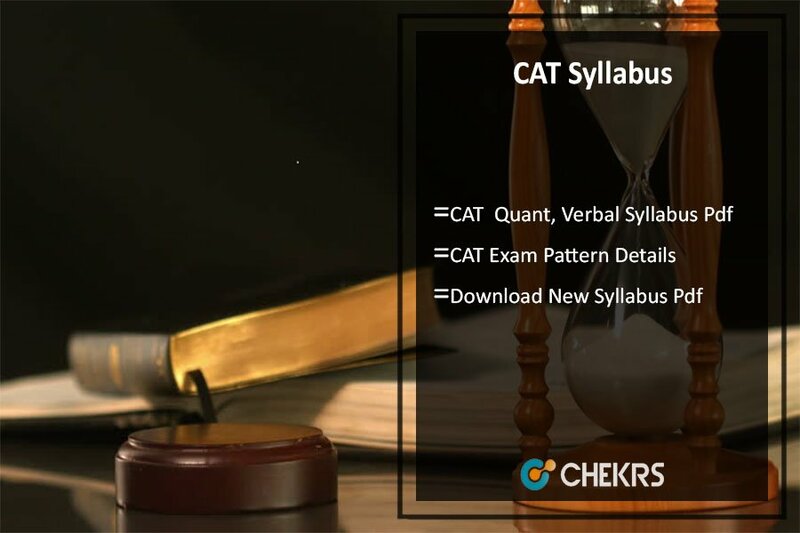 Thus applicants can now download here CAT Verbal Ability Syllabus and go through each topic to get complete details. Apart from this candidates can also get here CAT Reasoning Syllabus 2017 and get an idea about the reasoning section and accordingly prepare well for the entrance test. CAT is a national level, the competitive entrance exam for aspirants seeking admission in IIMs. Every year a huge number of candidates appear for the exam and thus candidates must have precise details of CAT MBA Exam Pattern so that applicants have knowledge of the number of question, duration of exam, marking scheme and prepare accordingly. Below you can check the details of CAT 2017 Exam Pattern. CAT 2017 is going to commence on 26th November, thus all the candidates need to go through IIM CAT Syllabus 2017 and get an idea about the important areas and topics. Common Entrance Test or CAT includes four sections. Applicants must go through the syllabus and start practicing the important topics on regular basis to qualify the exam. Below you can check CAT Exam Syllabus 2017. The CAT (Common Admission Test) is going to be conducted on 26th November for providing admission in management programs. The Test scores the aspirants on the basis of Quantitative Aptitude, Verbal Ability, Logical & Analytical Reasoning and Data Interpretation. Therefore all the candidates currently appearing for CAT can get here CAT Exam Syllabus And Pattern 2017 and get an idea about the exam along with the test of time management and crack the exam easily. In regards to more information, keep visiting our portal. In case of any query or review place your comments below.